If You’re In the Irish Spirit! Amazing selection, perfect for St. Patricks. Did you know that coconuts make great storage units? They can easily be transformed into any sort of cup/tray/organiser to hold everything from make up or jewellery to paint brushes and candy. I actually got this idea from my boyfriend; I said I didn’t like coconut water and so he got some whole coconuts to prove me wrong. I still don’t like the taste of them but I did get the idea of using the shell for a quick DIY project :). I experimented a bit with different colours and techniques, and I prefer to decorate just the rim of the shell and leave the rest, I think the coconut skin (?) looks pretty cool as it is. 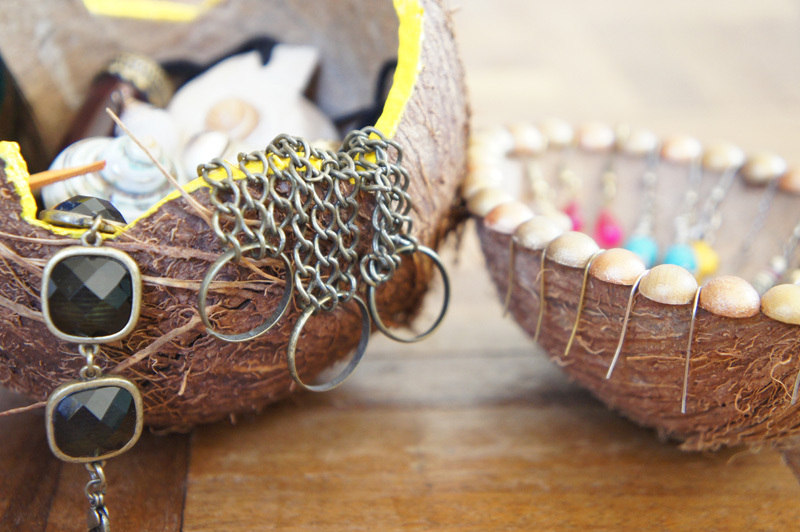 Here are two coconutty jewellery holders I made and now use to store bracelets/bigger rings and earrings. See below for a tutorial. Just tried out this technique, its amazing. A must-try idea for anyone looking for something quirky and creative!